The VC-T engine has better fuel economy than the 3.5-liter V-6 engine it replaces, with comparable power and torque. ATSUGI, Japan -- Nissan's Infiniti brand will debut the world's first production-ready variable compression ratio engine at the Paris auto show next month. The automaker says the engine matches diesels for power and fuel efficiency. The VC-T engine is a "major breakthrough in internal-combustion powertrain technology," Infiniti said in a statement. The engine's variable compression technology allows it at any given moment to choose an optimal compression ratio for combustion - a key factor in the trade-off between power and efficiency in all gasoline-fueled engines. The technology gives the engine the performance of turbocharged gasoline engines while matching the power and fuel economy of today's diesel and hybrid powertrains - a level of performance and efficiency the conventional gasoline engine has so far struggled to achieve. The turbocharged, 2.0-liter, four-cylinder VC-T engine averages 27 percent better fuel economy than the 3.5-liter V-6 engine it replaces, with comparable power and torque. Nissan says the new engine matches the diesel engine in torque - the amount of thrust that helps determine the car's acceleration. The engine is also cheaper than today's advanced turbocharged diesel engines, Nissan engineers said at the briefing at the company's technical and design center in Atsugi, south of Tokyo. They said it should also meet nitrogen oxide and other emissions rules in certain markets without requiring costly treatment systems. "Diesel engine is a hot topic globally. 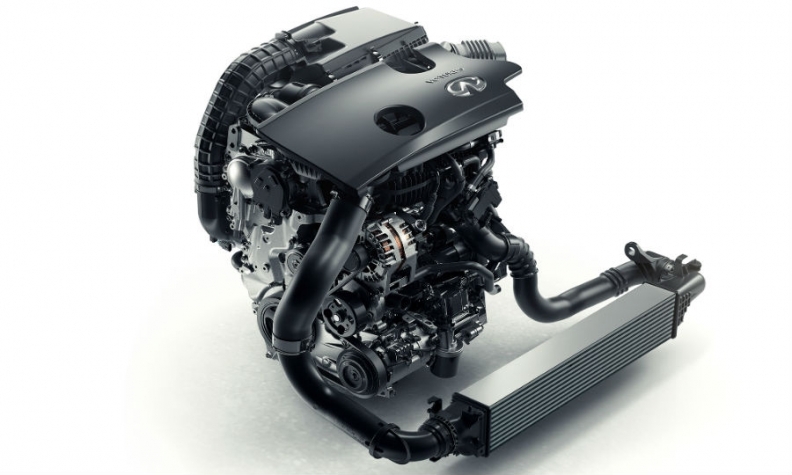 We believe this new engine of ours is an ultimate gasoline engine that could over time replace the (advanced) diesel engine of today," Kinichi Tanuma, a senior Nissan engineer who leads product development for Infiniti, told reporters at a pre-launch briefing last month. James Chao, Asia-Pacific managing director at consultant IHS Automotive, said: "Increasing the fuel efficiency of internal combustion engines is critical to automakers. Not all consumers will accept a battery electric vehicle solution. But significant challenges remain, such as increased complexity and cost, as well as potential vibration issues." The new powertrain will debut in Paris on September 29 and will initially be showcased in an Infiniti car to be unveiled next year, Nissan engineers said, without elaborating. Eventually, it is expected to be used in Nissan cars and possibly by its alliance partner Renault. In the engine the compression ratio measures how much the air-fuel mix is reduced, or compressed, in the gasoline engine's cylinders before it is ignited and produces energy. The higher the ratio, the more efficiently the engine works, producing better fuel economy and, with the addition of a turbocharger, more power. Traditionally, design engineers had to fix a gasoline engine's combustion compression ratio, essentially deciding whether to go for power or economy. Nissan says the VC-T engine can choose an optimal compression ratio variably between 8:1 and 14:1. That compares with mainstream production gasoline engines that run at compression ratios of 8:1 to 10:1. Exotic sports cars and racing cars run at 12:1 or more. "We think the VC-T engine could replace or become an alternative to some of today's advanced diesel engines," Tanuma said, noting the new engine's fuel economy and performance could be significantly boosted by coupling it to a gasoline-electric hybrid system, an option Nissan said it is considering.